New Delhi, India -- I intend to challenge the strongly held notions about Buddhists being considered as dalits. To identify oneself as dalit Buddhist inevitably tends to distort the vision of Dr Ambedkar, who acknowledged the prominence of Buddhist philosophy not only to dalits but also to the entire nation to cast away the ignominy of the Hindu Caste system. I personally believe that dalit and Buddhist are not synonyms they are in fact antonyms since dalits are defined as spiritually broken people with low esteem while a practitioner Buddhist would at least be spiritually strong if not materialistically. Buddhist and dalit can be related only in the sense that the former overcomes the later to reclaim the human personality. I do believe that Buddhism is the light that has cut across the darkness of dalits in India. Buddhism is spirit that has overcome the dalit shadow. Buddhism is the hope for the broken dalit. If the past has been dalit the future has to be Buddhist, anything lower would be less than honoring full human potential. "Dalit" is a resurgent word that has kept alive the struggle raised and fought by those who are deviously deprived from being treated as human. The word "Dalit' itself seems to be evoked in late 30's and connotes the large-scale dehumanization of a massive group of individuals for centuries by Hindu religious creed. The point is not about the etymology of word "dalit" but what it stands for, and realistically speaking they are 'people belonging to lower castes, who under the Hindu code were obliged to live lives unworthiness from birth to death'. I don't intend to go into details since my point is not why they are dalit? but why they stayed dalit? Two important aspects are revealed while analyzing the question why the marginalized people find it difficult to change the dalit status quo and fully embrace Buddhism, those are economical conditions and political quagmire. Nevertheless, in my opinion the overreaching reason is that dalits have failed to understand Dr. Ambedkar's philosophy of, "to educate, to unite and to agitate". The dalit intelligentsias in past and in present have yet to fulfill expectation of Dr Ambedkar. Elite and educated dalits, and Buddhists alike share responsibility for, failing to advance the soc-economic condition of the underprivileged dalits. At worst they have actually aggravated (or compounded) the situation by acting in ways, which in hind side will be judged as being for shortsighted political and economical gains. So who are the spellbound dalits? In plain language it is that part of dalit population that symbolizes the intellectual class, who finds it difficult to overcome the dalit curse. These spellbound dalits as well as pro-dalit intellectuals who propose to bring Hindu social reform are in fact trapped into the vicious circle of condoning the caste discrimination from within the caste system and being part and parcel of the Hindu system itself proved their efforts impotent. Dr. Ambedkar made it clear in no uncertain terms that "None should misunderstand the object of our movement as being Hindu social reform." However, it seems some elite Dalits in unwary upbeat mood perhaps for self-serving reasons, naively aim to reform the Hindu religion. This can only waste community strength and resources. It is unequivocally true that dalit exists in the society and suffers daily caste humiliation, however I fail to see how the responsibility of intellectual dalits is served by supporting the fight against caste horror from within the caste system. I challenge them to understand that Dr. Ambedkar's action of conversion to Buddhism was the culmination of an intellectual and emotional integrity that they would do well to emulate. History shows that it's not worth our precious lifetime to indulge in sanitization of an established religion that proposes caste discrimination and implicitly practices it in the modern world. Dalit intellectuals should use the community strength and property to build a formidable (post Hindu) Buddhist Sangha to face challenges towards dalit empowerment. The principal legacy that Dr Ambedkar left for the betterment of dalits and the country as a whole is the renaissance of Buddhism. 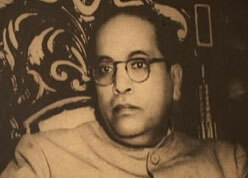 Dr. Ambedkar realized that mass conversion of dalits to Buddhism would be revolutionary for his followers. To follow the Buddhist doctrines and practice would not be easy for the converts: it differs from Hinduism and challenges its every aspect. The worst fear that Dr. Ambedkar contemplated and which today stands a true prophecy, that either the converted dalits may contaminate Buddhism by continuing to follow the Hindu deities and rituals, or may fail to understand the essence of Buddhism. To safeguard from this eventuality Dr. Ambedkar proclaimed the twenty-two vows that need to be strictly practiced integral to Buddhism. Dr. Ambedkar as a father of his people built a bridge for the future of dalits to help them reclaim human dignity. The refusal to accept the dehumanized treatment integral to Hindu religion culminated in his embracing of the Buddhist religion and having dissociated himself from Hindu religion. To quote Dr. Ambedkar, "In every country the intellectual class is the most influential class" and therefore the dalit intellectuals were trusted to carry forward the battle for reclamation of human personality. But today the beleaguered dalit finds no solace in the midst of its own intellectual class due to inherently low self-esteem of its intelligentsia. Moreover, the dalit intellectual's finds it hard to overcome the dalit obsession that leads them to emphasis from every platform their forbidden dalit identity. There is scant respect to the life intended for them by their savior Dr. Ambedkar, as embodied by Buddhism. Unfortunately, those dalit intellectuals and Buddhists who have succeeded to overcome the dalit spell have yielded to economic and political gains and failed to influence their brethren positively. No wonder that the young dalit generation presently can find no influential role model even a distance closer than Dr. Ambedkar. In the 21st century the growth and development of any community gains momentum from the consistent influx of dedication, and determination by those who work for community prosperity, which is both material and spiritual. The dalit obsession has so far succeeded in hampering the potential of aspiring dalit youth to meet the challenges of life. This is evident from the lack of eminent professionals in the educational field, successful businessmen's, and astute politicians. Even the freedom gained by conversion to Buddhism is in most cases if not all is impaired by the dalit obsession. Dalit or Buddhist, no matter how successful he/she becomes will fail to achieve the zenith as long as he/she relates somewhere to the ghost of caste discrimination. It is essential to adhere to the twenty-two vows given by Dr. Ambedkar if we desire to defeat the dalit obsession and come out of the dalit shadow. Success in life and the betterment of self and community will follow. Having gone beyond the dalit shadow, if we try to understand and follow the Buddhist doctrine we will be putting life into the legacy of Dr. Ambedkar's war cry:- be educated, be united and agitate. In conclusion, a coherent Sangha of Buddhist practitioner with a social welfare outlook has the potential to be a savior of the nation- a far cry from languishing dalits lost in the midst of caste politics and pollution. WE SELF PROCLAIMED BUDDHISTS, since the DECLARATION OF our INDEPENDENCE from the Hindu religious slavery by the great leader DR. BABASAHEB AMBEDKAR, ON 14 OCTOBER, 1956 need to SOLEMNLY VOW to BE JOINTLY AND SEVERALLY RESPONSIBLE to OVERCOME THE GHOST OF CASTE DISCRIMINATION and move forward TOWARDS HOPE, and PROSPERITY along with our dalit brethrens in converting to Buddhism uphold the legacy of our great leader who taught us that "WITH TRUTH ON OUR SIDE THERE IS NOTHING TO FEAR ABOUT". Sadhu!